High frequency sound of 2-50 MHz is used in medical ultrasound systems. This is well above the human hearing range of 20-20 kHz. Sound is propagated through a medium as the molecules are vibrated creating pressure waves with areas of compression and rarefaction. The waves have the characteristic features of wavelength, frequency and amplitude. Wavelength (λ) is the distance between two areas of maximal compression (or rarefaction). 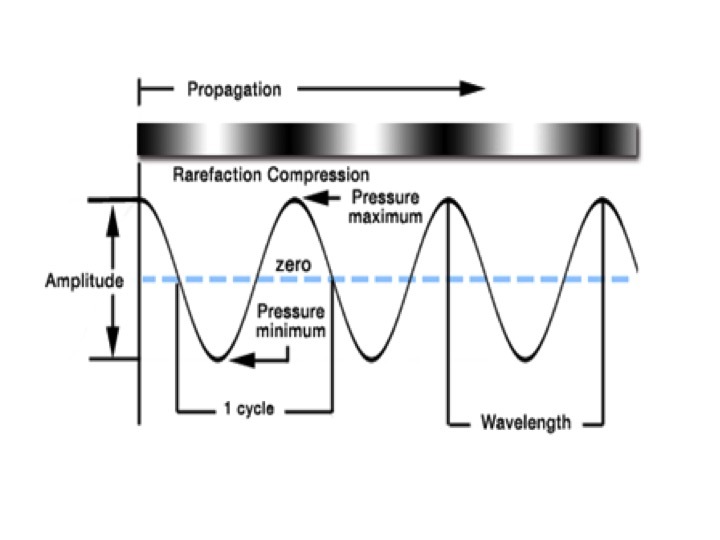 The importance of wavelength is that the penetration of the ultrasound wave is proportional to wavelength and image resolution is no more than 1-2 wavelengths. Frequency (f) is the number of wavelengths that pass per unit time. It is measured as cycles (or wavelengths) per second and the unit is hertz (Hz). It is a specific feature of the crystal used in the ultrasound transducer. It can be varied by the operator within set limits – the higher the frequency, the better the resolution but the lower the penetration. The magnitude of pressure change is given by the amplitude. It is expressed in decibels on a logarithmic scale. The sound waves travel at a Propagation Velocity (v) dependent on the density and compressibility of the medium. In soft tissue propagation velocity is relatively constant at 1540 m/sec and this is the value assumed by ultrasound machines for all human tissue. Hence wavelength is inversely proportional to frequency. Acoustic Power is the amount of acoustic energy generated per unit time. Energy is measured in joules (J) with joules being the amount of heat generated by the energy in question. The unit is the Watt (W) with 1W = 1J/sec. The biological effects of ultrasound in terms of power are in the milliwatt range. Pierre Curie discovered that when an electrical current is applied to a quartz crystal its shape changes with polarity. This causes expansion and contraction that in turn leads to the production of compression and rarefaction sound waves. This was termed the piezo-electric effect. He later discovered the reverse also occured, an electrical current being generated on exposure to the pressure waves of returning echoes. Ultrasound transducers contain and array of piezoelectric crystals functioning as transmitter and responder. The frequency of the generated wave is a function of the crystal used. In a standard disc shaped transducer the beam shape is cylindrical. Initially the beam is of comparable diameter to the transducer as the series of ultrasound waves that make up the beam travel parallel to each other. This is the near-field or Fresnel zone. At some point distal to the transducer however the beam begins to diverge which will reduce the ability to distinguish two objects close together (resolution). Beyond the point at which the beam begins to diverge is the far-field or Fraunhofer zone. It is possible to focus the ultrasound beam to cause convergence and narrowing of the beam thus improving (lateral) resolution. Focusing can be achieved by either mechanical or, in a phased array element, by electronic means. If the transducer face is concave or a concave acoustic lens is placed on the surface of the transducer, the beam can be narrowed at a predetermined distance from the transducer. 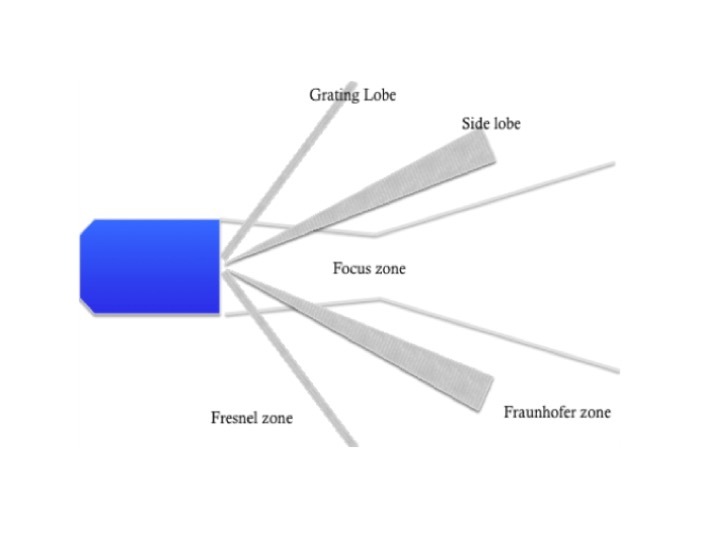 The point at which the beam is at its narrowest is the focal point or focal zone and is the point of greatest intensity and best lateral resolution. Figure 2. Schematic of beam characteristics. Multiple side lobes may be present. The ability of ultrasound to distinguish between two objects is the resolution. The resolution may be spatial, discrimating distance between objects or temporal, discrimation movement in time. Spatial resolution can be further divided into axial resolution and lateral resolution. Axial Resolution is the ability to recognise two different objects at slightly different depths from the transducer along the axis of the ultrasound beam. It is improved by higher frequency (shorter wavelength) transducers but at the expense of penetration. Higher frequencies therefore are used to image structures close to the transducer. Lateral Resolution is the ability to distinguish objects that are side by side. It is generally poorer than axial resolution and is dependent on beam width. As the ultrasound machine assumes that any echo originates from the centre of the beam then two objects side by side cannot be distinguished if they are separated by less than the beam width. • Use the highest frequency (but note that this occurs at the expense of penetration). • Optimise the focal zone. • Use the minimum necessary gain (see the knobology section). • Minimising Depth – Ultrasound is sent in a pulse of 2-3 cycles in length, the spatial pulse length and then the transducer assumes a receive mode listening for echoes. The depth of scan alters the time required for sound wave to travel to and from the transducer. Thus a shallow scan reduces the distance and time taken and allows more pulses per second. This is known as the pulse repetition frequency (PRF). • Narrowing the Sector to the area of interest - narrowing the sector angle. • Minimise Line density (but at the expense of lateral resolution). As sound waves strike a surface between two tissues of differing acoustic impedance some of the sound is reflected. The strength of the returning echo is dependent on the difference in acoustic impedance between two tissues,. 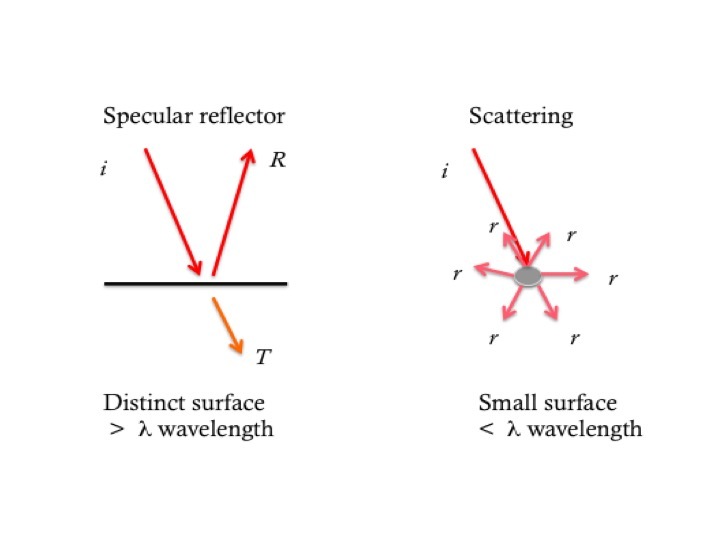 Two principal types of reflector are described, a specular reflector where the sound beam is reflected in a single direction and a scattering reflector where the energy is reflected in multiple directions. The former usually has a surface width of more than 1 wavelength while the latter has a surface width less than one wavelength. The image created in this way is dependent on the direction from which the sound encounters a barrier, and is directionally dependent; a phenomenon known as Anisotropy. It therefore increases with depth and higher frequencies.